when they were first blasted out. The unsolicited texts from the UAP also tell people to tune into Nine for an “important two-minute announcement”. Since announcing his intentions to run for parliament, the UAP has been engaged in an advertising frenzy, which ramped up early this year as the party tries to secure votes. The former Queensland politician has invested heavily on ads, with the UAP saying it would spend at least $50 million on ads, according to reports in The Sydney Morning Herald. It's thought that the majority of the ad spend is spent with Channel Nine and goes well into the miilions. Palmer, the former federal member for Fairfax, is returning to politics after serving one term as a MP. The current campaign includes out of home, TV, print and unsolicited texts, which angered Australians and called into question laws governing personal information and political advertising. Since then, Palmer himself has said he'll restrict political parties access to such information for campaign use. People immediately expressed their anger over the recent ad blitz, complaining the “Australia's freedom is under threat' message initially had them alarmed. Given the government is yet to announce a date for the election, how long these ads will continue is unknown. The United Australia Party has been contacted for comment. Clive Palmer's United Australia Party (UAP) has entered a new phase of its ad blitz, with a print campaign now telling people to watch a TV ad campaign on Channel Nine tonight. 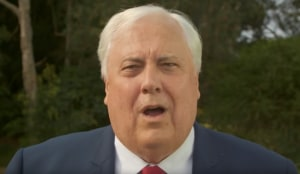 In consecutive ads littered throughout newspapers, Palmer tells readers, on two pages in a row, that "Australia's Freedom is Under Threat" and urges them to watch Channel Nine tonight between 7.20pm – 7.35pm in order to "learn what's really happening". The ad is marked by yet again more text messages today, which previously angered people when they were first blasted out.